FanDuel is a web-based fantasy sports game and with 6 million registered users. The season-long game is now simplified. The winning amplified. The money real. And the result? A new way to play fantasy -- fan vs. fan in a test of sports knowledge and fantasy knowhow -- where winners can taste victory on any given day. Not just once a year. 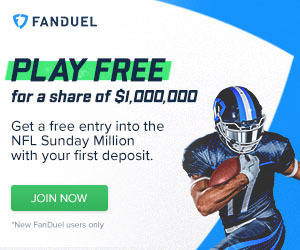 Join FanDuel and get your entry into the Sunday Million.